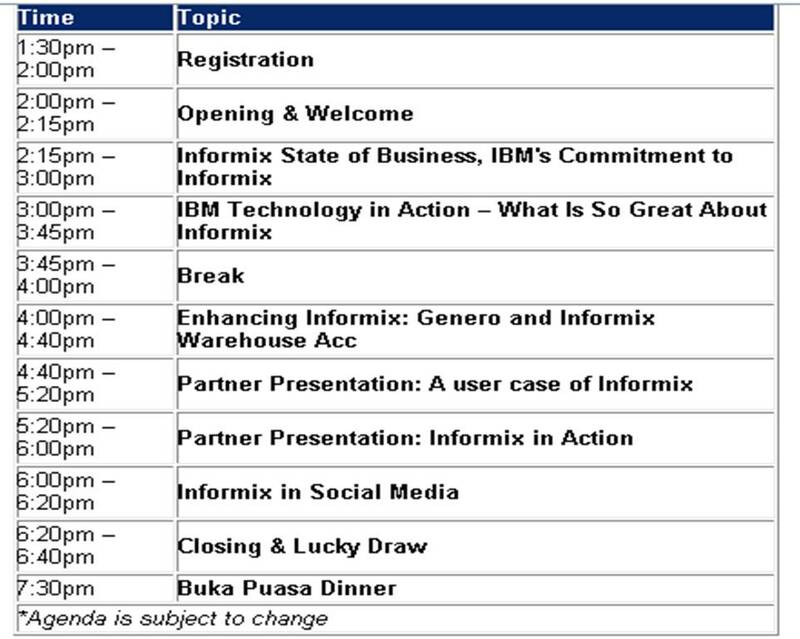 Good news for our Malaysian Informix users: Discover Informix – Informix user group event is coming to Malaysia on August 2nd 2012. Be sure to be a part of the largest gathering of Informix users in Malaysia on August 2nd (Thursday) from 1: 30 PM to 7: 30 PM at Ballroom A, Level 10, DoubleTree Hotel, Kuala Lumpur, followed by Buka Puasa dinner that will commence from 7:30 PM onwards. You can get an up-close look at the capabilities that set Informix apart by being a part of this event and get exclusive coverage on new content and value propositions of Informix, straight from the IBM Informix leadership team who will be present at the event. Register today and be sure to be a part of this event! This entry was posted in Data, Data base softwares, Data Management, IBM, Information, Information management, Informix, Road Map, smart meter, smarter planet and tagged Informix, user group by IBM Data Warehousing. Bookmark the permalink.